A book co-edited by an ESF professor has been chosen as an "Outstanding Academic Title" for 2015 by Choice Magazine. 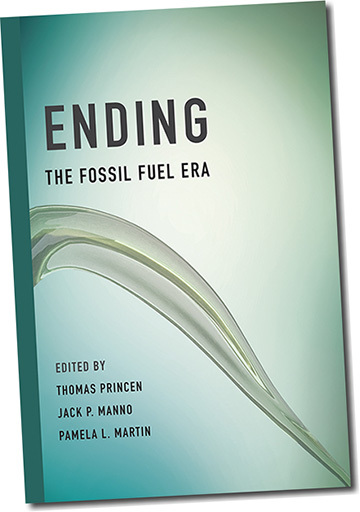 Professor Jack Manno's book, "Ending the Fossil Fuel Era," focuses on six case studies that reveal how individuals, groups, communities and an entire country have taken first steps out of the fossil fuel era, with experiments that range from leaving oil under the Amazon to ending mountaintop removal in Appalachia. The authors argue that transitioning to a post-fossil fuel era can begin by delegitimizing fossil fuels rather than accommodating them. Manno edited the book with Thomas Princen of the University of Michigan and Pamela L. Martin of Coastal Carolina University. The book was published last year by MIT Press. Author Rob Nixon, who wrote "Slow Violence and the Environmentalism of the Poor," called Manno's book "urgent, timely, and brilliant." "From Appalachia to the Amazon, from Australia to Germany, the authors capture the transnational spirit of resistance to the violence and the dead-endedness of extreme extraction. If you believe we need to make the bold imaginative, ethical, technological, and political transition to a more just and biophysically sustainable planet, this book is indispensable reading," Nixon wrote. Choice: Current Reviews for Academic Libraries, a publication of the Association of College and Research Libraries, is the premier source for reviews of academic books and digital resources of interest to scholars and students in higher education. More than 22,000 librarians, faculty, and key decision makers rely on Choice magazine and Choice Reviews Online for collection development and scholarly research. Choice reaches almost every undergraduate college and university library in the United States. Every year, Choice subject editors single out for recognition the most significant print and electronic works reviewed in Choice during the previous calendar year. Appearing annually in Choice's January issue, this prestigious list of publications reflects the best in scholarly titles and attracts extraordinary attention from the academic library community. The 2015 feature includes 606 titles in 54 disciplines and subsections. importance relative to other literature in the field, distinction as a first treatment of a given subject in book or electronic form, originality or uniqueness of treatment, value to undergraduate students and importance in building undergraduate library collections.